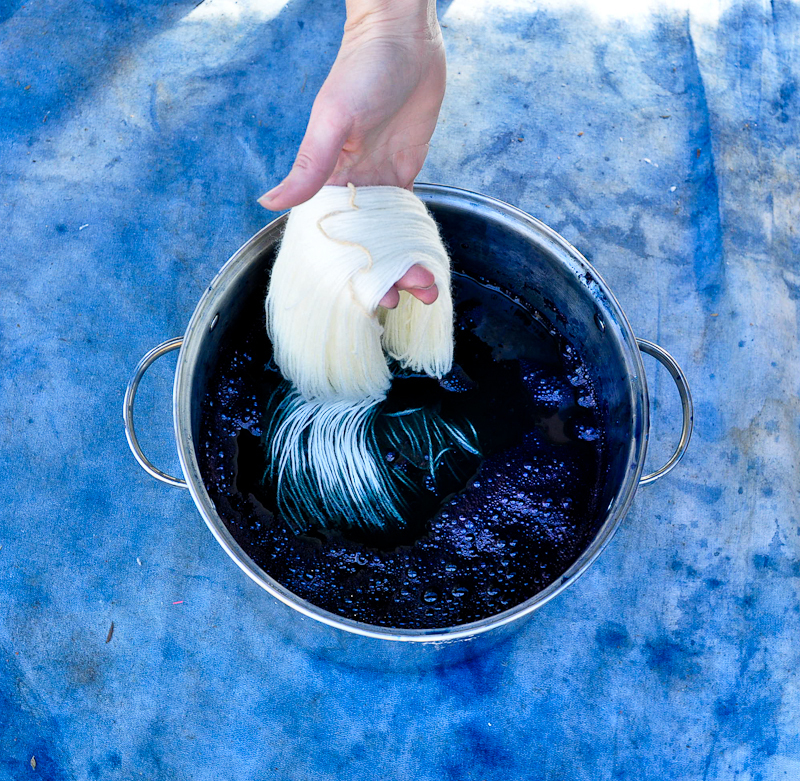 Indigo is the natural dye I have worked with most, and challenges me more than any other. You could spend your life working with it, and still learn something new every day. 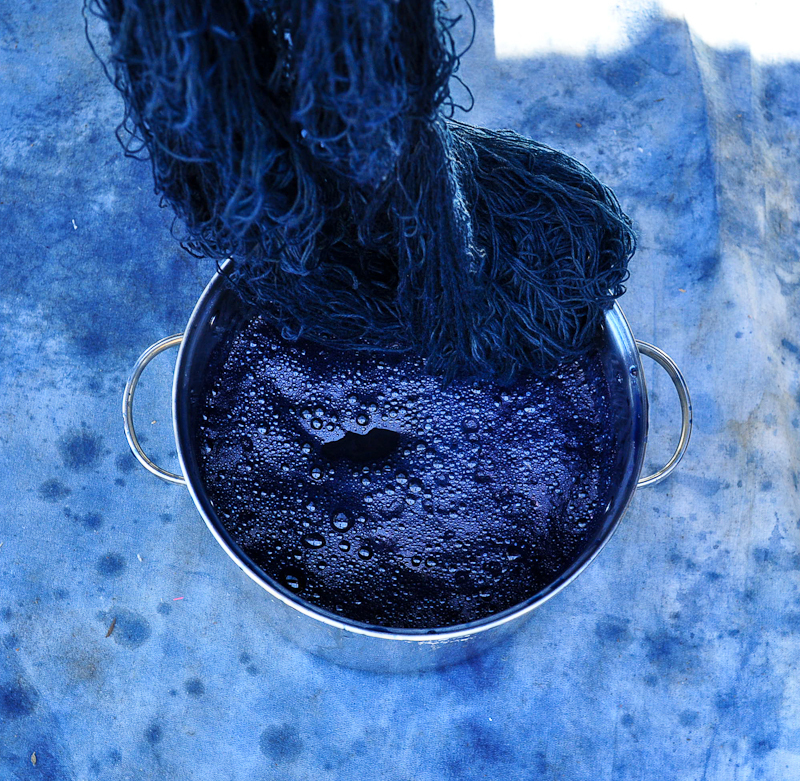 Indigo dyed textiles always seems to be alive. It’s a colour that changes with the light, and on sunny days will be bright and cheerful, on grey days it will be suitably sombre. Indigo is the blue for all occasions. Derived from the leaves of the Indigo plant, there are a few different varieties. I use a certified organic Indian Indigo, Indigofera Tinctoria. The Japanese strain of Indigo has the botanical name of Polygonum Tinctorium, and is also known as Dyers Knotweed. 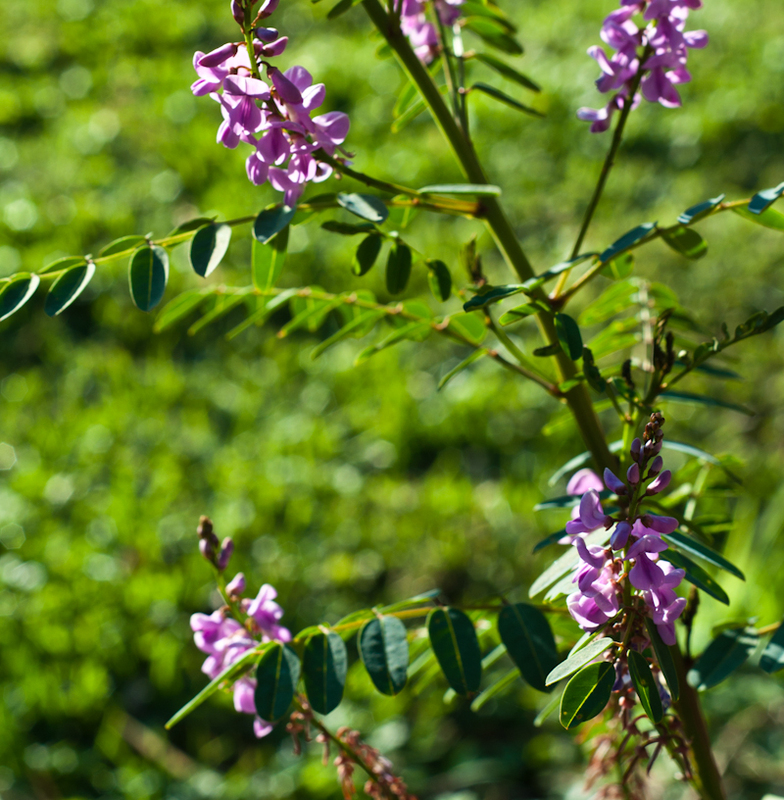 Australia also has it’s own indigenous Indigo, known as Indigofera Australis. It is a rather gorgeous shrub, and has delicate purple flowers in the springtime. For the gardeners out there, it likes a well drained position in half shade. Working with Indigo requires patience, and persistence. 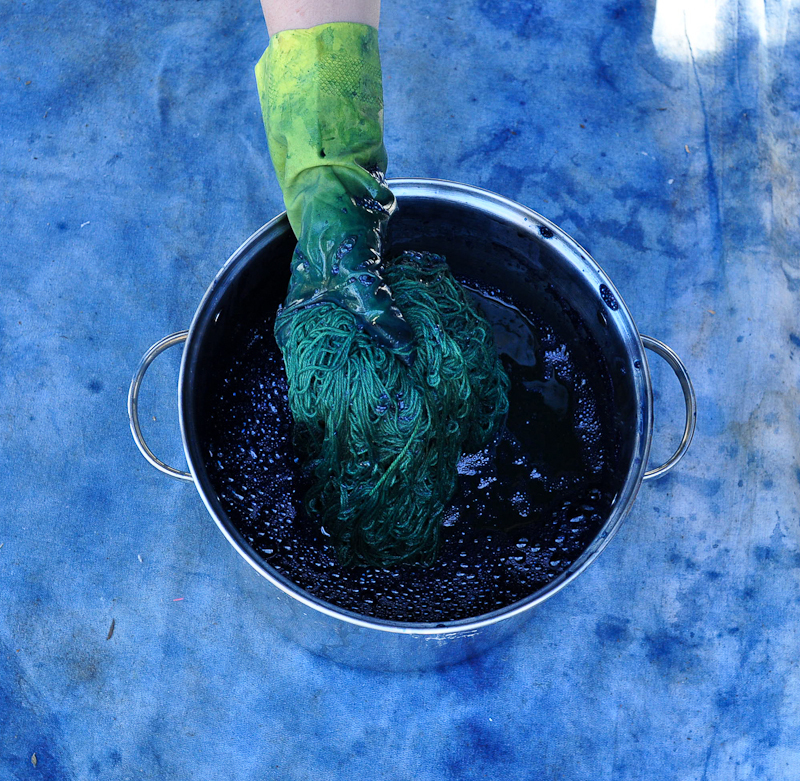 When you dye with Indigo, you are required to re-dip your piece to build up the colour, and leave it to oxidise fully between dips. Repeated dipping also improves it’s wash and light fastness. All of my work receives at a minimum 3 dips in the Indigo vat. The darker shades are built up over many more dips, and a piece I worked on recently had around 15 dips to reach the desired shade. That patience I mentioned earlier was starting to wear a touch thin by the end of that piece! 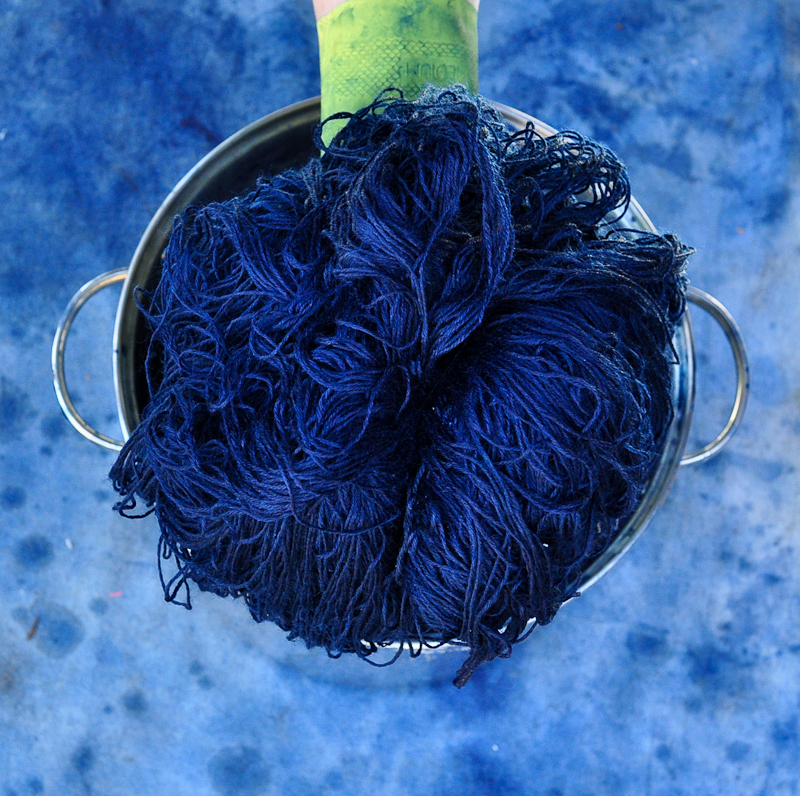 Indigo, while tricky to work with, is a great natural dye to begin your journey with. It is a lovely colour, it is challenging, and working with it is extremely satisfying. If you’d like to learn more about working with Indigo, I do teach one day workshops, which will be starting up again in the springtime. If you’d like to come along and dip your proverbial toe in the vat (not your real toe, it WILL turn blue) then you can drop me a line via my contact page to be notified when classes are available for booking. Here’s a little taste of the Indigo process, enjoy! I had no idea there was a native Australian indigo- I think I may have even seen some up at Mitchell River. Do the different species of indigo plant yield noticeably different colour results? I think that while they do yield slightly different shades, I think it comes down more to how strong the indigotin content of the leaves is, and I think what kind of vat you make also effects the results. I am interested in natural indigo and writing a book on the economic history of Indian indigo. I am organizing a one-day seminar on global indigo at the London School of Economics on 2 May 2015. While visiting your website, I looked at the images (above) and liked them very much. I wonder if these images are subject to copyright. I would like to use one of them for the flyer/brochure of the seminar. All photos on my website are subject to copyright, as you will find with the images on most peoples blog are. If you’d like to discuss it further and be granted permission to use a specific image, please contact me via my email address vic @ bindandfold.com. At present none of my images can be used by anyone except me without my permission. Thanks!